Food manufacturers often use online recipes and enticing photography to draw visitors to their websites and social media pages. It is imperative that every ingredient be shown to its best possible effect, taking care to highlight the manufacturer's product. Overhead food photography is a great to ensure that all ingredients are highlighted in a way that makes people want to buy the manufacturer's featured products. For this image, created for La Victoria, I used a studio stand with a special arm that enables overhead photography without angle distortion. I used large softboxes to emulate daylight while taking care to ensure appropriate definition in the highlights. 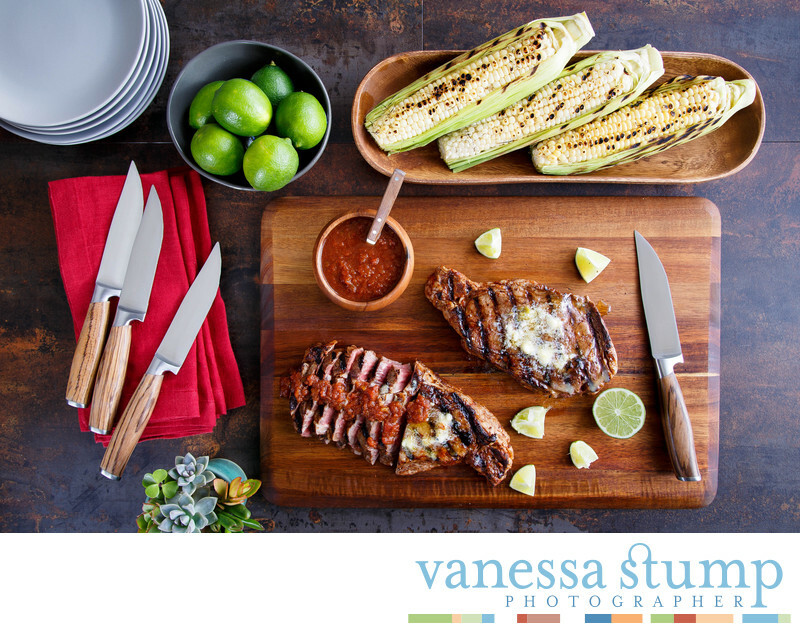 This photo was created for La Victoria's Roasted Red Pepper Grilled Ribeye Steaks with Lime Butter recipe.